Plenty of bizarre sleep tricks exist that can help you sleep at night if you're experiencing spotty sleep or are prone to bouts of insomnia. Constantly worrying you're not going to fall asleep will not help you get there faster. Don't let the persistent fear of sleep prevent you from sleeping. Instead, say to your brain that you're going to stay awake. According to Bustle, this is called the sleep paradox because the effort your body uses in trying to stay up will cause you to get tired. Remain in bed and simply tell yourself "I'm going to stay up" rather than looking at your phone or laptop. If it helps, read a book or daydream to get your mind off trying to sleep. Have you ever been clock-blocked? In other words, has looking at the clock too often during the night ever blocked you from getting to sleep? When not sleeping, we tend to get anxious. That anxiety results in our glancing over at the digital clock on our nightstand or the clock hanging on the wall to determine how long we've been awake. This does not help us fall asleep. Instead, it makes us worry why we're not sleeping and wonder how long it will be until we get back to sleep. Find a sheet and cover the clock so you don't have to see it. That way, you won't be constantly checking and rechecking, only causing more disruption to your sleep. Better yet, don't worry about the time. Stay in the present moment and you will fall asleep. Block the clock; don't let it block you! At night, while we lay beneath layers of sheets and clothing, the heat can quickly ramp up. 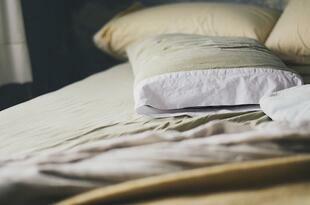 Sweat and heat are two factors that do not contribute to a comfortable night of sleep. That's why it's recommended you turn down the temperature -- in more ways than one. Besides turning down the thermostat (preferably to about 60-68 degrees), try splashing your face in cold water for 30 seconds. How Sleep Works refers to Swedish researcher Per Scholander who found that dunking your head resets your system through a reflex known as the "mammalian diver reflex" that decreases both heart rate and blood pressure. With these natural factors subdued, you'll have an easier time falling asleep. Reluctant sleepers may find this exercise helpful. For those who like to keep their mind focused on a particular task, try squeezing your muscles. Start at the bottom by curling your toes. Release. Focus on the muscles in your feet. Tighten them. Release. Do this with the muscles from the lower half of your body all the way up to your neck and face, and finally the top of your head. Known as progressive muscle relaxation, this simple procedure can ease your entire body into the peaceful state necessary for sleep. Much like focusing on breath, humming a simple, light tune can actually help you fall asleep. Diply references an interview in which Dr. Chris Idzikowski proclaims the best way to do it. "Breathe gently out of your mouth, lips together so you hum,” he said. “Try to hum for the whole out-breath. Notice how it vibrates in your chest. Focus fully on this vibration over six breaths then sit quietly for a moment. Tell yourself 'I am ready for sleep,’ get up slowly and go to bed." It's quite a humdinger of a trick! These tips may seem odd to you, but don't knock them before you try them. Release your doubts and you'll eventually find a successful practice that will you get a better night of sleep.